Over £400 billion worth of land once owned by Britain’s government agencies has been sold to private developers since Margaret Thatcher took office in 1979.² Contrary to public perception, these land sales have persisted under successive Conservative and Labour governments which have prioritized short-term transactions that offer private investors high returns on rising land values, over the provision of essential public services. The decimation of the National Health Service (NHS) Estate is documented in the Five Year Forward View (2014) and the Naylor Review (2017), which both describe the consolidation of primary and secondary care services into “mega practices” that vindicate the closure and downgrading of hundreds of hospitals and general practice (GP) family surgeries across the country. In an effort to improve “land efficiency,” the NHS is currently seeking buyers for 718 plots deemed “surplus to requirements.”³ This “commercial approach” to land disposal aims to raise £5.7 billion to help cash-strapped NHS Trusts, who have had annual budget rises restricted to one percent since 2010.⁴ Ministers have optimistically approved these selloffs in the hope that Trusts will be able to redevelop their facilities and build homes for staff. But if the sale of the NHS Estate fails to operate in the best interests of hospital trusts, clinicians, or patients, then who stands to gain from these transactions? 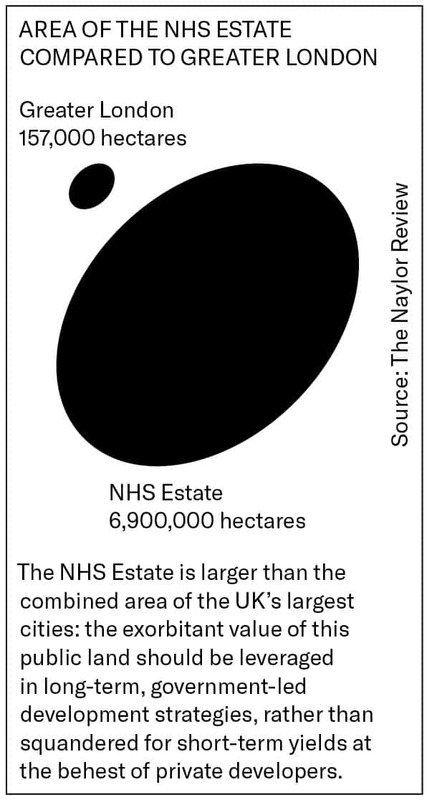 As stated in the Naylor Review, the NHS has neither an overarching strategy nor in-house technical skills to manage an estate 10 times the area of Greater London.⁹ The government’s ambition is to transfer the difficulties of owning and managing a colossal real estate portfolio to the country’s largest developers, in the hope that they will develop plots into affordable housing. With NHS Trusts unable to finance public housing development on their own land, the true beneficiaries of these land sales are institutional developers who can retain the long-term yield from their projects. 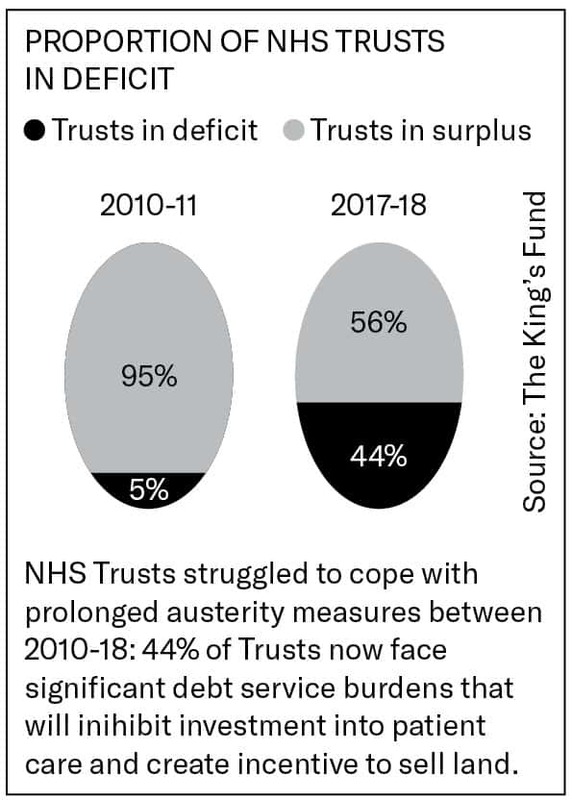 push already inundated Trusts further into deficit. Similar Private Finance Initiatives (PFI) have extended beyond land procurement and into building maintenance. St. Bartholomew’s Hospital in London is now tied to a 35-year PFI contract to renovate and extend existing facilities which will cost £6.85 billion in loan interest alone.¹⁰ Ministers have insisted that PFIs ensure the risk of hospital construction and maintenance is borne by the private sector, where building delivery is also assumed to be more efficient. However, 35 percent of healthcare PFI projects have run over budget and have typically failed to insulate the public sector from hospital construction risks: the collapse of construction monolith, Carillion, forced Royal Liverpool and Birmingham Midlands Hospitals back into public administration, with the taxpayer assuming a record £7 billion liquidation bill, and leaving facilities unfinished.¹¹ The evidence abounds for the detrimental effect that PFIs and private land sales have had on the NHS’s ability to deliver suitable healthcare centers and attend to patients on time. The British public is ominously witnessing the structural and financial degradation of its most treasured public institution: in the process, funding for core NHS healthcare services is becoming embroiled in the fluctuations of private real estate markets and weaved into the narrative of the housing crisis unremedied by the country’s largest developers. Instead of ransacking the NHS Estate to give the private sector leverage over public services, the government should develop land it already owns and redirect profits into emerging technologies and facilities that build a resilient, twenty-first century healthcare system. If the government endorses such public development vehicles, by raising Trusts’ borrowing caps and retaining land to expand facilities, design and construction industry professionals could take a leading role in delivering hybrid models of healthcare and housing that meets the needs of patients and investors, without devastating the public purse. Robert Naylor, “NHS Property and Estates: Why the estate matters for patients,” UK Government, March 31, 2017; Ibid.